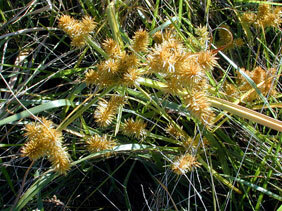 Also Called: Straw-colored cyperus, false nutsedge. Culms: Few or solitary, erect, stout, glabrous, sharply 3-angled. Leaves: Crowded near base, flat, narrow, longer leaves about same length as culm, 1/12 to 3/5 inch wide, margins somewhat rough. Inflorescences: Spikes, simple or compound, cylindrical, with 20-90 spikelets radiating horizontally or ascending; stalks 4-12, unequal; bracts 3-10, leaf-like, much longer than inflorescence. Spikelets: Numerous, flat, linear, 1/4 to 1 inch long, 5-25 flowered; scales loosely overlapping, keeled, golden-brown or "straw" color, slender pointed. Fruits: Achene, unequally linear-3-sided, less than 1/12 inch long. Habitat: Moist, open ground of meadows and fields; stream, pond and lake borders; sandy or gravelly soils. Distribution: Principally in the east 4/5 of Kansas. Comments: Straw flat-sedge can be quite variable in appearance.